We got a set of Cuisenaire Rods in the mail yesterday, and Little Bear couldn’t wait to experiment with them. So I dumped them out on the rug this morning, helped her sequence them from smallest to largest, then showed her how to build “fact families” with them. I worked with her up through the number 5 and watched as she quite correctly showed that 1+4, 2+3, 3+2, and 4+1 all equaled five. Then, I walked away and left her to work on her own. Bless the child’s heart. I love her rabid creativity, her wild imagination, her passion and enthusiasm. I am regularly amazed, inspired, and driven to the brink of madness by her “indigo child” tendencies. She can quite literally get lost between the car and the front door, yet she looks at a tub full of small wooden sticks and immediately envisions a robot. … These are the moments that remind me why we choose to educate at home. I want to preserve that inner fire. I don’t want her forced to create fact families when her heart is challenging her to create art. But somewhere along the way, I realize that she does need to learn the basics of math and reading, and I’m hoping/praying/choosing to believe that a bit of structure and a whole lot of unschooling will eventually get her there. For today, we bypassed the rest of the fact families and, instead, grouped, counted, and compared numbers of Cuisenaire Rods as we cleaned up. Since moving to a larger town, we’ve been taking full advantage of the local offerings — preschool art classes at the local museum, weekly activities at the local library, ample opportunity to observe nature at the local zoo, and more. Up until today, though, we’d consistently missed “Super Story Time” at the library, a monthly chance for preschool kids to explore a topic through songs, stories, and crafts. This time around, I stuck the flyer on the refrigerator, made sure Little Bear was well aware of the date, and actually made it to the library for Monster Madness. I have to admit that I was a bit nervous about the topic. Little Bear does NOT do well with scary … as in I’ve learned to preview episodes of Dora before letting her watch them. Both cubs love “monsters” in the vein of Tedd Arnold’s Huggly Books and Ed Emberly’s Go Away, Big Green Monster! , though, so I decided to chance the event and hope for the best. Thankfully, our children’s library chose a superb collection of imaginative, yet gentle tales for the preschool crowd. (In fact, both of the girls’ favorite monsters appeared in the line-up, much to Baby Bear’s delight!) The craft, however, proved the highlight of the morning for both of them. The librarian provided them with prepainted puzzle pieces, popsicle stickers, googly eyes, stickers, and glue. The girls then used the materials to fashion a monster stick puppet of their very own. Baby Bear seized on the lone pink puzzle piece and delighted in covering it with tiny stickers, but vehemently insisted that all creatures — monsters included — should have exactly two eyes. We wrapped up the day with a reading lesson, several logic puzzles from our Critical Thinking Co. books, Kumon workbook fine motor activities (cutting, mazes, and coloring), and three games of Hi Ho Cherry-O. All in all, a lot of fun and a bit of learning — just what this Mommy Teacher hopes for each day. We celebrated another milestone today. Both girls slept in their bedroom all night long. Now, this may not sound like a huge deal to some people, but we co-slept from the beginning, and last night was the first night since DD1’s birth that no little person has occupied our bed, crawled into our bed midway through the night, or woken up crying because she discovered that she wasn’t in our bed. I slept six blissfully uninterrupted hours and actually found myself slipping into the girls’ room at daybreak this morning just to make *sure* everything was OK.
By the time the girls’ crawled out of bed, I was wide awake and ready to make today another fun day of celebration. I fed them breakfast, got them dressed, then headed to McDonald’s for a snack and playtime. This was the first time we’d ventured into our local fast food headquarters, and I was pleasantly surprised to discover that the play area was both clean and virtually empty at 9:30 a.m. on a rainy Friday morning. What I wasn’t as pleased to discover, however, was that the play area boasted a big screen television tuned to Nickeledeon and blaring preschool programming. “Bubble Guppies!” Little Bear shrieked with delight. “Looks like it is,” I acknowledged, initially grateful that the programming was appropriate for young children. Then, I watched her edge away from the play area and toward the screen. She took a few steps toward the play area, then turned back, mesmerized by The Screen. Then Baby Bear came over to watch. With much urging, Little Bear finally made it into the play area … where she promptly climbed into a lookout spot, stretched out, and again fixed her gaze on the electronic Pied Piper. … Apparently children who cannot remember to play in the presence of television also cannot remember to chew … or swallow. We ended up moving to the a table tucked away in a corner, out of sight of The Screen, and the girls at last ate a few bites of their snack. I was still pondering how to get them to ignore The Screen and play when aide arrived in the form of five other little tykes — two girls about Little Bear’s age and three little boys about Baby Bear’s size. Bubble Guppies might trump active play (Grrrr! ), but active play with new-found friends definitely trumps Bubble Guppies! “Kiss! Kiss!” demanded Baby Bear. I reached her side right after she planted a very wet kiss square on the lips of a very startled little boy. “Me yike kiss!” she whined. Sigh. What’s a mom to do with a sweet loving little girl who totally does not “get” the concept of personal boundaries? This mom decided it was time to head to the bookstore and let Little Bear shop with her Tooth Fairy money. And so we began the harrowing journey past fancy pens, shiny rings, and tantalizing sweets to the other side of the store, complete with all sorts of baked goods, chocolates, and beverages. I tried to contain Baby Bear. Little Bear did her best to help distract her. But at the moment I turned to sign our receipt, she spied several long rows of metal cans full of energy drinks. “Dink!” she said, as she grabbed for the nearest one. “Ssssssss” came the sound of carbonated beverage spraying out all over the refrigerator case. I quickly clapped my hand over two tiny holes in the side of the candy and handed the dripping mess to the cashier. “I guess we’ll be paying for one of these as well,” I said. I’m still not sure what exactly happened. Baby Bear really hadn’t been that rough with the thing. “She just touched it!” Little Bear said in disbelief. But that touch cost us an extra $3 and about 5 minutes of clean-up. I’d like to say the rest of the day went a little smoother. Unfortunately, we’d been home less than an hour when I heard a blood-curdling scream from Little Bear. I ran to her only to find her holding her bottom lip, which was covered in blood. In the midst of squabbling over a toy, she’d somehow managed to flip over and slam her bottom lip into her steel bed frame. Ouch. Not to be outdone, Baby Bear fell and conked the back of her head on the concrete porch. And just for good measure, she managed to pull their wooden rocking horse over on top of herself and give herself a coordinating knot on her forehead. Add in spills, potty accidents, and a broken vacuum cleaner, and today had all the makings of a disaster. But it wasn’t. In fact, Little Bear said it a “great day, the best day I’ve ever had. Except maybe yesterday.” Why? Because she chose to focus on the successes of the day. The girls got to play and make new friends. We sat in the bookstore reading books and carefully choosing which ones we wanted to add to our library. The girls had fun playing in the house and even got to have some fun outside, thanks to the covered porch that’s a part of our new apartment. Little Bear tackled four pages in her reading book and sailed through all four of them with few issues. We took time to do handiwork — cutting, tracing, coloring, and pasting — for the first time this week. We spent some time in one of our just-for-fun Critical Thinking Company activity books. And we read, read, read. We read before breakfast, read at the bookstore, took several reading breaks throughout the afternoon, and read yet more before bedtime. Sure, we had a few crazy moments, but for most of the day, we had fun. And when all was said and done, that’s what she chose to remember. “My teeth hurt too bad to eat!” Little Bear complained Monday. She’s slowly recuperating from a nasty respiratory infection, complete with cold sores, so I assumed she was erroneously ascribing her general mouth pain to her teeth. … Until I brushed her teeth Tuesday afternoon and discovered that her lower left central incisor was noticeably out of place and standing at almost a 45-degree angle inside her mouth. A quick examination revealed that BOTH of her lower central incisors were loose … to the point that she really was struggling to bit such things as carrot sticks, apple slices, and other crunchy foods. My first thought was that our calamity-prone child had somehow knocked her own teeth loose, and I immediately began to quiz her. Little Bear assured me that she had not injured her mouth in any way and that her teeth had just mysteriously started hurting over the weekend. That’s when we examined her mouth more closely and discovered two new teeth already pushing their way through her gum line. Little Bear does not do well with pain … or the mere thought of anything that might cause pain. We opted to let nature take its course and wait for the teeth to fall out on their own. The girls were participating in a toddler/preschooler art class at a local museum this morning, so we decided to have a picnic lunch at a nearby outdoor playground. Little Bear had repeatedly climbed to the peak of the highest play structure, slid down a gigantic spiral slide, run around the play structure, climbed back up, and slid again. Baby Bear insisted on following suit, so I was stationed at the top making sure my daring 21-month-old didn’t tumble over the edge and fall nearly two stories to the ground. When I saw Little Bear reach the bottom and deviate from her usual pattern to run over to the picnic table and Daddy Bear, I assumed she needed a drink. Moments later, though, she was back by my side, jumping up and down with excitement. I looked and saw blood — along with a gaping hole. Now, when a 4 1/2-year-old has just lost her first tooth, life can’t just go on as normal. I wasn’t sure whether to breathe a sigh of relief because the tooth had come out on its own, without tears or distress (and without her accidentally swallowing it!) or whether to cry because my “baby” had just taken an undeniable (albeit involuntary) step toward adulthood. I really wanted to cry. But I didn’t. (At least, not then.) Instead, I pulled her into a tight Mama Bear hug, gave her a kiss, congratulated her, and high-fived her all at the same time. Then I started racking my brain to come up with ideas for celebrating the first lost tooth. It involved cupcakes (because Little Bear wanted cupcakes). It involved chatting and daydreaming and wondering what the Tooth Fairy does with all those lost teeth. It involved role play with stuffed animals and Snap ‘n Style dolls and magnetic dress-up dolls. It involved staying up too late, then laying in bed beside a little girl who just couldn’t go to sleep because she wanted to catch a glimpse of the tooth fairy (whose existence she still isn’t sure about). It involved an early morning “The Tooth Fairy came! The Tooth Fairy came! And she took my tooth and left me a letter with money on it!” wake-up call. Oh, the things you learn through hands-on experimentation! We’re moving in one week, and school books have been packed away for several days. School these days has been reduced to a bit of online learning (Thank you, ABCMouse.com and Starfall.com! ), a bit of reading, a whole lot of “practical life skills” (packing, cleaning, and playing nicely while Mommy packs and cleans), and whatever “we need to use/do/finish that before we move” activities I happen to find in various nooks and crannies of the apartment. One lone packet of powder waiting to be mixed with water and transformed into slime. We’d mixed the first two packets in this 3-packet set several months ago and set the third one aside for later. Unfortunately, the mixing cup and measuring syringe had not made their ways back into the canister, so tonight’s slimy fun was an experiment in every sense of the word. (1) Extra water makes extra slimy slime. Since we didn’t have the measuring instruments that came with the kit (and since the kit states measurement in terms of 1 1/2 syringes rather than oz. or milliliters), we had to “guess” at an appropriate amount of water. Based on the amount of slime we ended up with, I’m pretty sure we doubled or tripled the amount of water. (2) Slime gets firmer over time. It may start out as thin as green gravy, but it will get thicker and firmer. Who cares if it takes 10 minutes to reach optimal texture instead of 3? (4) Slime can be flattened into a pancake. It should, however, be flattened on a non-porous surface. It does not peel off cotton knit yoga pants particularly well. (6) The top of someone else’s head is also not an ideal work surface. (7) Slime can be stretched thin enough to see through. (9) Slime can be used to identify one’s body parts. Repeat for ears, mouth, teeth, hair, etc. (10) Slime can entertain a 4-year-old for hours. Our slime ball is currently fashioned into a snail shape and is sitting on top of the piano. Little Bear is “playing” a song for it. 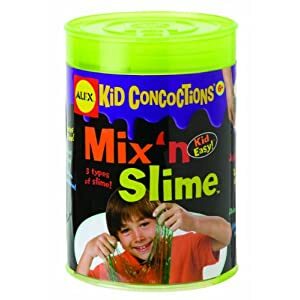 … I’ve got to say that I really wasn’t impressed with Alex Mix ‘n Slime the first time we used it. Packet one turned into a rock hard lump surrounded by slightly colored water. As we dumped it in the trash, we realized that we should have added the powder a little at a time while stirring vigorously. Packet two turned out a bit better, but was still more solid than slimy. Tonight’s fun, however, was more than worth what I paid for the kit. It’s starting to look like I’m going to have to pry the stuff out of my children’s hands to get them bathed and ready for bed tonight. At this rate, I might just buy the product again … especially if I happen to find it in a clearance bin again! Snakes, Snails and Puppy Dog Tails? Along with reading about snakes, the girls thoroughly enjoyed slithering around the living room, “tasting” the air with their tongues, and “hibernating” under a dining table “cave.” At Jessica’s request, I hunted down a picture we’d taken last spring of her petting a ball python. Too close for Mommy’s comfort! I promised her that we could visit the reptile room the next time we visited the zoo. I told her that yes, she probably would get to pet a snake again “someday.” I also assured her that she could have a pet snake of her very own … just as soon as she had a job of her own and a home of her own to accommodate her slithery friend. Beyond our impromptu snake study, Little Bear did several jigsaw puzzles and built with Magna-Tiles this morning. She did a couple of lessons on ABCMouse.com while Baby Bear napped this afternoon. Then, we headed outside for some fun in the sun. Little Bear has been learning to roller skate and managed to skate to the end of our apartment complex today without falling. She moved slowly, but she kept moving and stayed upright. Much as I wanted pictures, I had visions of her sprawling head first on the sidewalk and dared not move far enough away from her to actually take pictures. Once Little Bear tired of skating, both girls piled in the wagon for a walk around the block and a hunt for whatever creatures we could spy. Then, we headed back to our own yard, where Baby Bear chose to play ball and Little Bear hunted for bugs, twigs, and leaves. A doll and a ball … what more does a girl need? Finding a leaf with holes in it, she was sure it must have been food for a hungry caterpillar. Some people greet the new year with eager anticipation, embracing change and fresh opportunity. I, however, find myself greeting 2013 much like my toddler greets a strange dog. There’s excitement and anticipation, to be sure. But as the new year races toward me, there’s a definite moment of anticipation as I wait to see whether it proffers a gentle paw of friendship or knocks us flat on our backsides. As we embark on the new year, Daddy Bear has officially joined the ranks of the unemployed. During the job hunt, we’re making an effort to cut all extraneous spending from the budget. That means no random book, game, DVD, toy, or craft purchases for the foreseeable future. (We have plenty of resources already. Mommy just happens to be a book/educational product junkie. …) We’re contemplating yet another move. We may also be facing weeks or months of separation if contract work takes Daddy to another part of the state or country. Any way you cut it, 2013 is going to be stressful. So what changes do I want to make to help us weather the year ahead? Yes, we’re a family, and yes, we love each other. The girls hear the words “I love you” dozens of times each day. In fact, the first sentence Baby Bear uttered was “I yuv you!” But there are also times (plenty of them) that we drive each other crazy. As we move into a stress-filled year, my number one goal is to give my children the security of knowing that we love them — and one another — all the time … even at 4 a.m., even when we’re prying Play-Doh out of the carpet or cleaning up yet another potty accident, even when they’re grumpy or out of control, even when we’re grumpy and out of sorts. I do a great job of selecting quality toys and games for the girls. I don’t do such a great job of actually sitting down and playing with them, however. My goal for 2013 is to spend at least an hour a day actively playing with my kids. Not “academic” play, mind you. Actual get-down-on-the-floor-and-roughhouse or play freeze tag or race cars down ramps or dress Snap-n-Style dolls for the 213th time play. We’ll still find time to build Duplo patterns, create healthy play food meals, and play math or reading games to be sure, but I don’t want academics to overshadow healthy, active, imagination-building and memory-making FUN. The most convicting Facebook quote of 2012? Listen earnestly to anything your children want to tell you, no matter what. If you don’t listen eagerly to the little stuff when they are little, they won’t tell you the big stuff when they are big, because to them all of it has always been big stuff. Ouch. How often have I scolded my children for “not listening,” only to turn around and tune out their childish prattle so I can get some work done? Really, what work could possibly be more important than the work of hearing and understanding my children’s hearts? I spend at least an hour a day reading to the girls, but I honestly cannot remember the last time I read a “Mommy” book from cover to cover. I bought at least a dozen “for Mommy” books last year, eagerly read the first few chapters they arrived, then set them down next to my computer to read “when I had time.” This year, I want to take full advantage of the 24 hours I have in every day and make time to read books that inspire me, challenge me, and help me become a better parent to my children.Topping Mommy’s reading list for the next month? Find more enjoyment in what we already have. Though it may not seem so at first glance, this goal goes hand in hand with all the above. As we move into 2013, I want to make a conscious effort to enjoy my children, to enjoy playing with them, to enjoy listening to them. I want to help them enjoy the countless toys, games, books, puzzles, craft supplies, and other learning tools they already have. I want to take time to enjoy books already sitting on our shelves. Is part of this fueled by a need to cut expenses? Yes. But to a much larger degree, I’m realizing how blessed we truly are. We have enough. And frankly, I’d rather spend my time enjoying our blessings than participating in the feverish rat race to gain more, more, more. We woke this morning to a whopping three inches of snow (a rare treat here in West Texas), and the girls could not wait to get out in the white stuff. Little Bear especially has been wanting to make snow angel ever since we read a story that included a bit about a child making a snow angel, and this morning’s snow gave her the opportunity to do just that. Both girls ran out the door squealing with excitement and dove into the snow with both hands. Baby Bear pulled her hands out of the snow almost as fast as she’d put them in and ran straight back to my arms, indignantly declaring the snow to be “Code! Code! CODE!” Little Bear threw her whole body in the snow and happily made a snow angel. Note the singular article? She stopped with one and like her sister came running over to protest the coldness of the experience. My little snow critics were temporarily quieted by the appearance of a neighbor. Apparently, cold is more tolerable in the presence of friends. But when their playmate headed back inside, they too decided they’d had enough. “I don’t like snow!” Little Bear announced as she walked back into the apartment. … I didn’t know whether to try explain the science of snow or give her the old speech about trudging through a foot of snow in -40 weather to get to school in my younger years, so I kept my mouth shut and gave her dry clothes instead. Obviously, my child has forgotten the winter she spent in Upper Michigan where she briefly experienced REAL cold. “What do you think it is?” I queried. Obviously, the Christmas treats have lingered too long, but I think she might just be on to something! After Baby Bear’s nap and Little Bear’s computer time, we sat down as a family and spent about an hour using Magna-Tiles to build 3-D mazes for a Hexbug. Little Bear helped me create obstacles for the Hexbug to navigate in my single-level maze, and both girls enjoyed watching the Hexbug work its way down and out of Daddy Bear’s four-story maze. Little Bear built a nice large house for the Hexbug, while Babyzilla ultimately leveled all our structures and buried poor Hexy beneath a pile of rubble. We rounded out the day with a slew of read-alouds, a couple of chapters from our current Bobbsey Twins mystery, and an introduction to nocturnal animals. We also read Katie and the Spanish Princess , the first of a several art appreciation books I’d purchased for this year. I’m not sure how much Little Bear learned about Spanish art, but she immediately fell in love with the books and asked if we could get the whole series. We don’t have the whole series, but I can’t wait to share the other books we do have with her in the days ahead. We’ve been counting down the days until Christmas this month — a great way to sneak backward counting, beginning subtraction, time concepts, and various other math concepts into the daily routine! Little Bear turned our Christmas countdown blocks to the number 14 this morning, then squealed with excitement when she realized that 14 days equaled two weeks. During my classroom teaching days, I found the days leading up to Christmas almost torturous. It was a constant struggle to keep excited little people on task, on schedule, and focused on The Curriculum with all the excitement of the winter holidays in the air. Now that my “class” has been reduced to my own two girls, I can breathe a silent prayer of thanks that we had no rigid schedule to observe and no curriculum that must be completed by a certain date. Instead, we’re free to follow their interests … which at present seem to center on CHRISTMAS. We read … a lot. We read the Biblical account of the journey of the wisemen and read a retelling of the same story from The Bible in Pictures for Little Eyes . We read a fictionalized narrative about Mary and Joseph’s trek to Bethlehem, their search for a room, and the Holy Child’s birth in a stable from The Lion Storyteller Christmas Book along with several traditional Christmas tales from other parts of the world taken from the same book. We even made a blanket fort in the living room and curled up inside it to read a stack of just-for-fun Christmas books (along with all the Maisy books and Karen Katz books Baby Bear insisted on adding to the read-aloud stack). Little Bear thought we needed a wreath on the door, so I picked up a $2 foam wreath craft kit at Hobby Lobby and helped the girls put it together this morning. It might look like cheap foam to the rest of the world, but Little Bear dubbed it a “masterpiece” and couldn’t wait to show it to Daddy. We also fingerpainted Christmas trees to be decorated with sticker “ornaments” tomorrow. And somewhere a long the way, we managed to squeeze in a phonics lesson, a bit of handwriting, a couple of Mind Benders puzzles, and at least half a dozen Can You Find Me? riddles … along with a couple of board games, some outside playtime, and plenty of indoor dress-up and make believe fun. Well, the calendar may say that today is December 1st, but the weather tells an entirely different story. We’ve still got afternoon temperatures in the 80s and signs of autumn all around. This morning, the girls and I went on a leaf hunt. We matched leaves to trees, reviewed the parts of a leaf, then collected the prettiest leaves we could find to make leaf creatures. before Little Bear decided that the sun was entirely too bright and that she’d had enough outdoor crafting for the day. After the girls ran and played for a bit, we did some quick leaf rubbings to preserve nature’s display of autumn finery. Once the letter was finished, we headed to our local toy store to deliver it and take pictures with the Man in Red. Unfortunately, Little Bear panicked when she actually saw him and refused to go near him. Baby Bear, on the other hand, saw jingle bells and candy canes and was all over him. Oh, well, one out of two isn’t too bad!